Home » Blog » Amazon Deal Blog » One More Day For Free Canvas! One More Day For Free Canvas! It’s the FREE 8×10 Gallery Wrapped Canvas offer from Canvas People! THIS AMAZING OFFER ends Tomorrow! Got a fabulous Christmas photo? Put it on a canvas, and then save it for next year… what a fun Christmas decoration! You essentially have a $55 credit. 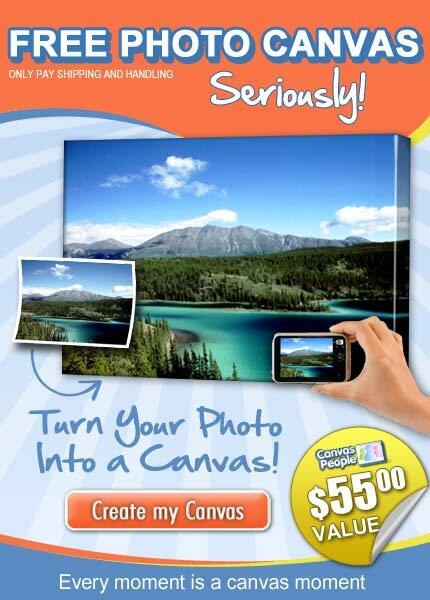 You can use it to get a FREE 8×10 Canvas, OR you can upgrade to a larger size. Read my post about how to make the most of this offer. We’ve all done this offer personally and have been very pleased with the end result! Some people recommend you do the photo in black and white (learn how to convert your photo to black and white for FREE in this post). If you’ve procrastinated getting your FREE 8×10 Canvas, it’s time to do it now!! How are you using your FREE Canvas Offer? On my order shipping is now 17.95 instead of 14.95. Did you upgrade to a larger canvas?